We have had rain for several days as the remnants of the hurricane that hit the Baja has drifted over Texas and onto our heads! So I couldn’t go to the lumber yard. 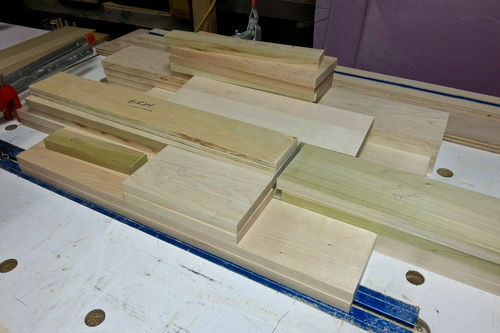 Instead, I went through my lumber rack and dug up all of the maple I could find and a few pieces of poplar. 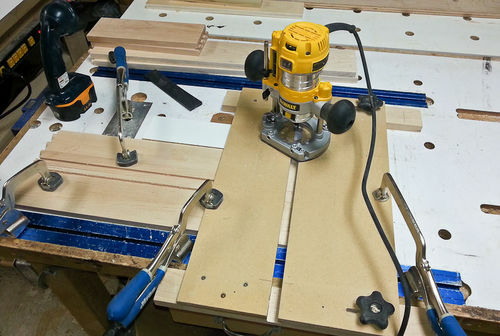 I managed to mill enough for the six top drawers. 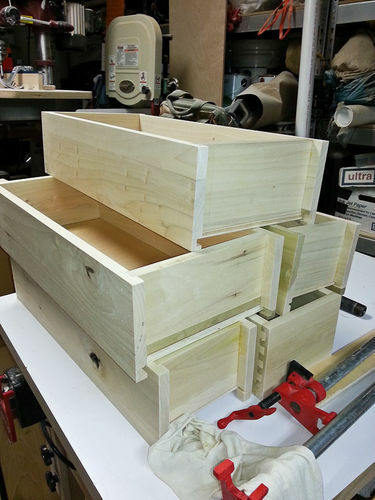 These drawers have 4 inch sides so there were a few pieces that got glued together and then milled. 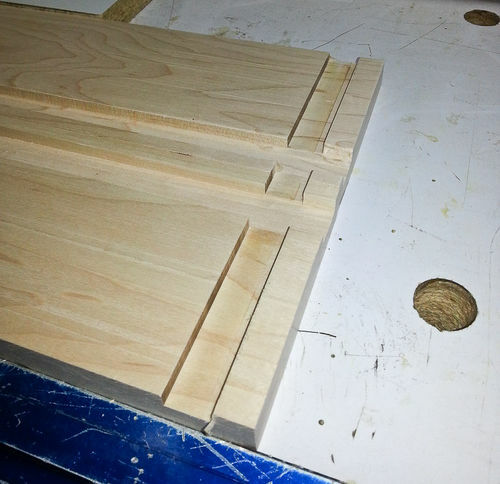 The drawer fronts have half blind dovetails. 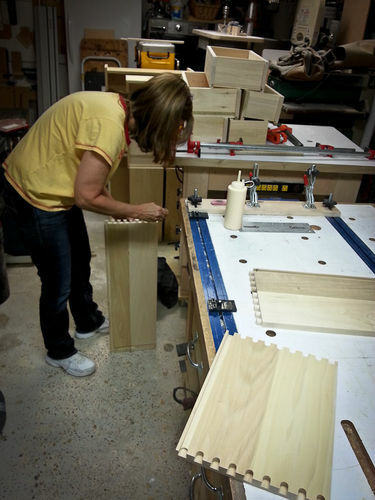 The rear of each drawer has a simple dado the back piece fits into. 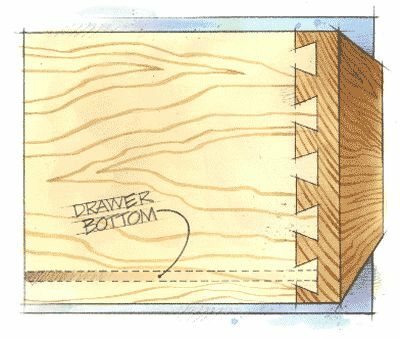 The bottom of the smaller drawers have a 1/4 inch groove for the bottom to fit. 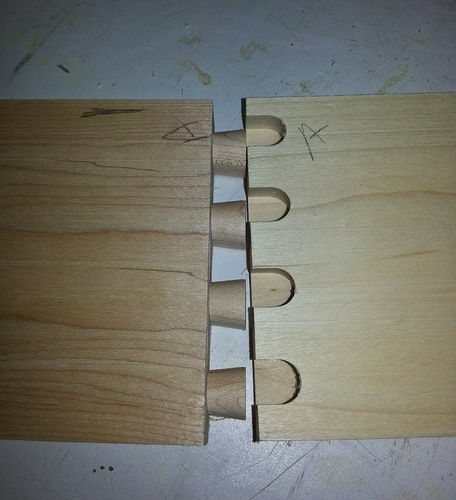 The wider drawers have a 1/2 inch groove for the bottoms. 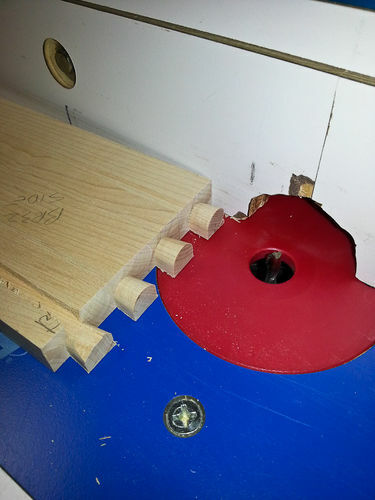 To cut the dado for each side, I used an exact width dado jig and a 1/2 inch flush trim bit in my router. 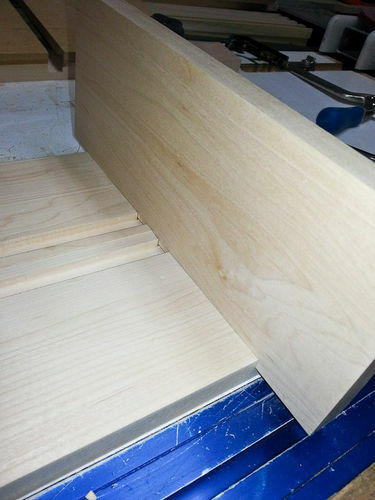 I used a Porter Cable Dovetail Jig to cut the half blind dovetails. 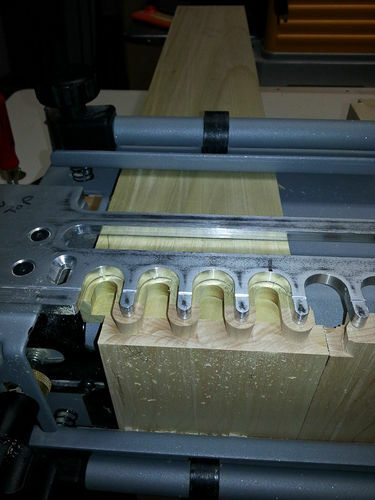 Note that I cut the drawer bottom groove so it is hidden from outside view. 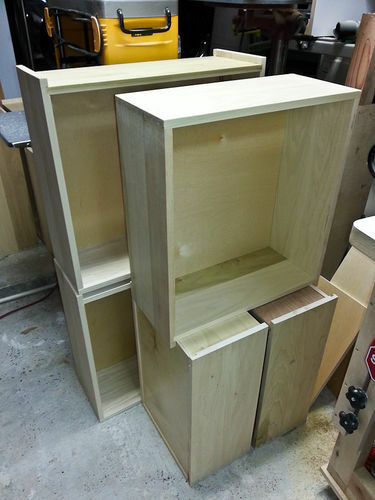 When I assemble the drawers, the back piece will have the bottom ripped off at the groove so it fits in from the top and then the bottom can be slid in from the rear. 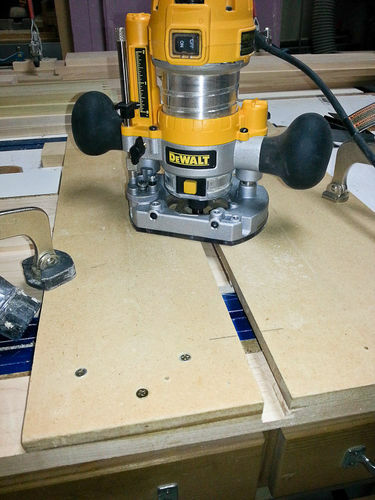 Attach it with nails or screws and it can be removed if it gets damaged. 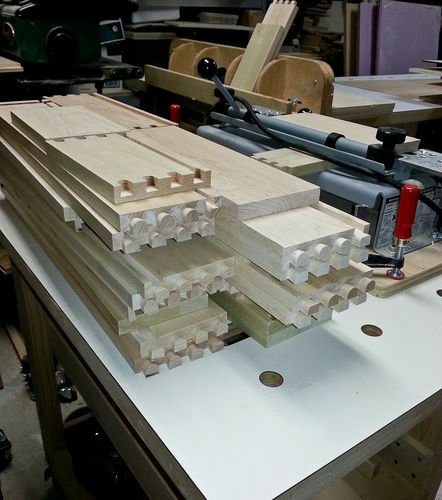 The weather finally cleared and I now have the remaining stock to mill for the remaining doors. 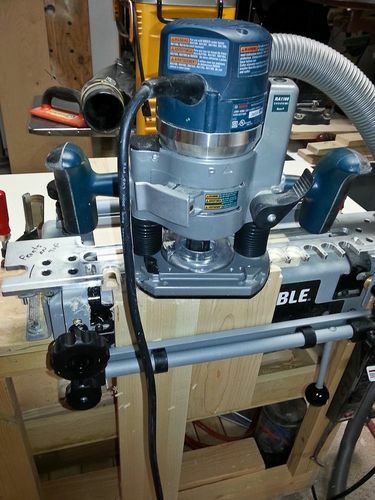 It is amazing what usable lumber one can find in their scrap wood pile. I should look through mine. It’s nice to see drawers built like a tank. I bought some inexpensive kitchen base cabinets for my shop, and the last of four drawer bottoms fell out today … along with some contents that I had forgotten were there. Sort of a bad-news/good-news situation. YIPPEEE! That is the one we were looking for! Why is it the last one is always at the bottom of the pile? 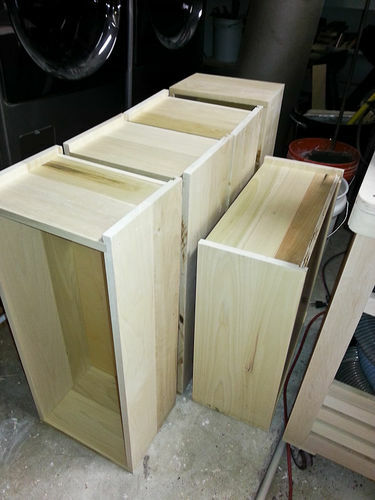 Twenty one drawers complete. A little sanding and they will be ready for the spray booth.